To increase the challenge, Derek was loaned an Olympus OM-D E-M10 Mark III and lenses for the day. The camera's small form factor lends itself to street photography, as you’re less likely to draw attention to yourself. Fitting a wide-angle lens and pre-focusing enables you to approach closely for intimate results. We initially didn’t have to stray far from Brighton Pier to find interesting shots. The structure of the pier itself lent itself to interesting abstracts and silhouettes, while the seaside staples of the shoreline, fisherman and backlit deckchairs were there to tempt us. Ben had the burden of a tripod, but this meant that long-exposure shots of the derelict West Pier – a Brighton classic – were pretty much off the menu. Given his career background, it was unsurprising to see Derek expressing his eye for architectural pictures, even on the beach. “Looking towards the pier, I could see the potential for a great structured image,” he says. “Using a long lens meant that the planes could be flattened, although shooting handheld meant I had to be sure to keep the camera steady. Expert opinion: Defined by its rhythmic repeating lines, Derek’s shot of the pier is tightly structured. The little amount of breathing space allowed at the top between the building and the edge of the frame, combined with the straight verticals and horizontals, results in a graphical image that we find very satisfying. Holiday season was yet to get into full swing, so the pier wasn’t heaving with people. This gave Derek more breathing space to pick out potentially interesting scenes with both short and long focal lengths. Derek eschews camera straps in favour of cheap-and-cheerful wrist straps. 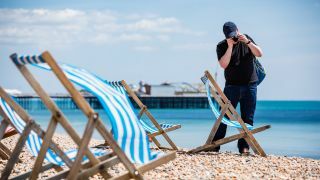 This means the action of bringing his camera up to his face is quicker and less noticeable than having to pull it off his shoulder and then set up the shot – something that can make all the difference in a street photography setting. Derek was keen to try out a range of lenses, from an 8mm fisheye lens through to the 75-300mm zoom. If you’re unfamiliar with the Olympus Micro Four Thirds system, the sensor is a quarter the size of a full-frame sensor – so doubling the focal length tells you the equivalent lens required to produce the same view on a full-frame camera. “The 45mm lens I was using has the equivalent focal length of 90mm, so it lets you get in close, and its compact size lets you do this discreetly,” says Derek. “For this shot, I tried to keep the figure in the window as the central focus, while still having an interest in the other thirds of the image. The central figure kept moving and people were walking past, so it was a waiting game to realise the image I had in mind." Expert opinion: Visually, this is quite a busy, intricate image, despite there not being much going on. The viewer’s eye is drawn to the guy in red on the left, thanks to that block of solid colour, with the flags looping around the shop front adding further emphasis; so it’s a shame he’s looking down. That being said, Derek’s captured a good sense of two workers grabbing a moment’s peace. Derek headed into the Lanes area later, preferring to initially work the area around the Royal Pavilion – a Grade I listed seaside residence of George, Prince of Wales, that was built in 1787. Like the West Pier, the Royal Pavilion has been photographed extensively, so once you’ve got the iconic views in the bag it’s definitely worth looking at ways that you can put your own spin on it. Derek opted for the ‘just another tourist’ look that ensured he didn’t stand out as a photographer. He avoided carrying an obvious camera bag too, instead opting to pack his kit in small pouches that were in turn placed in an everyday, colourful backpack. Derek rolled out one of the most potent weapons in the Olympus Micro Four Thirds arsenal to achieve this tight crop. The M.Zuiko Digital ED 75-300mm f/4.8-6.7 II lens gives an equivalent view to a 150-600mm lens on a full-frame camera (indeed, he only needed to take the focal length to 124mm, equivalent to 248mm in a full-frame), but in a form factor that’s much easier to carry and hold. Expert opinion: Once again, Derek’s trained eye for structure comes to the fore in this shot. Closing in on an odd number of design details (both the seven leaf-like windows and the 11 points on the crown-like shape) allows him to create a balanced frame, with an even number of features each side of the central elements.